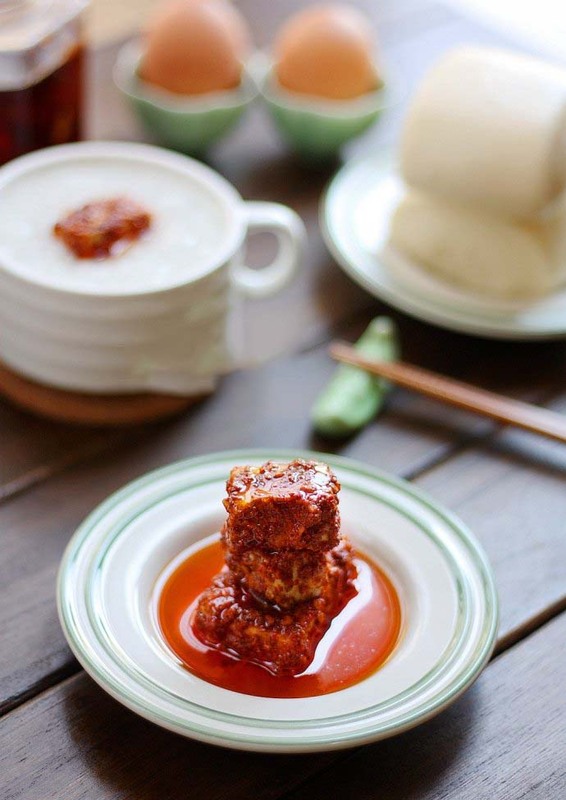 Fermented tofu is a traditional folk food that has been popular in China for thousands of years. Some time ago, a friend sent us some homemade fermented tofu. We all liked it so much, I wanted to try and make it myself. I was worried that the weather was too hot and that it wouldn’t turn out correctly, but I had determination! 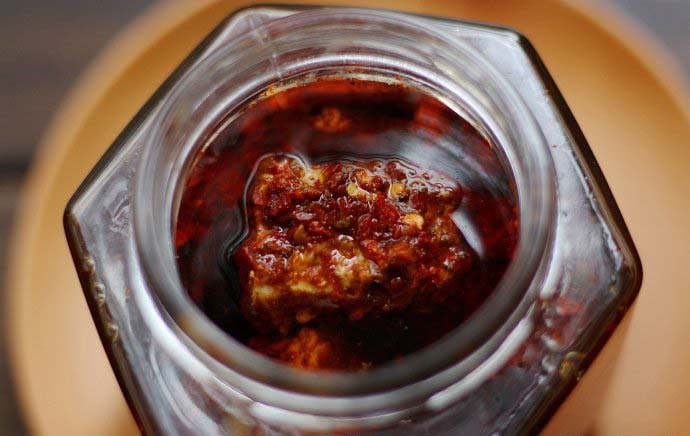 The content of zinc and vitamin B in fermented bean curd is very rich. It can not only supplement vitamin B12 levels in the body, but also prevent senile dementia. 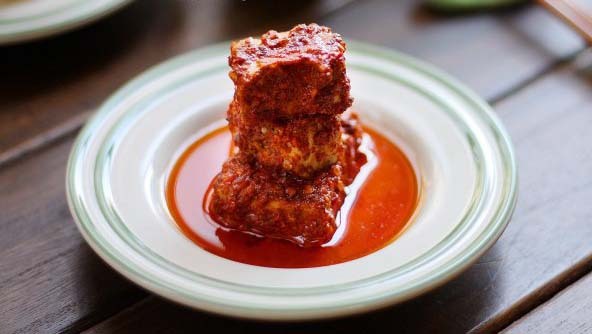 The protein of fermented tofu is twice as much as fresh tofu, and it is easily digestible and absorbed, so it is also called oriental cheese. 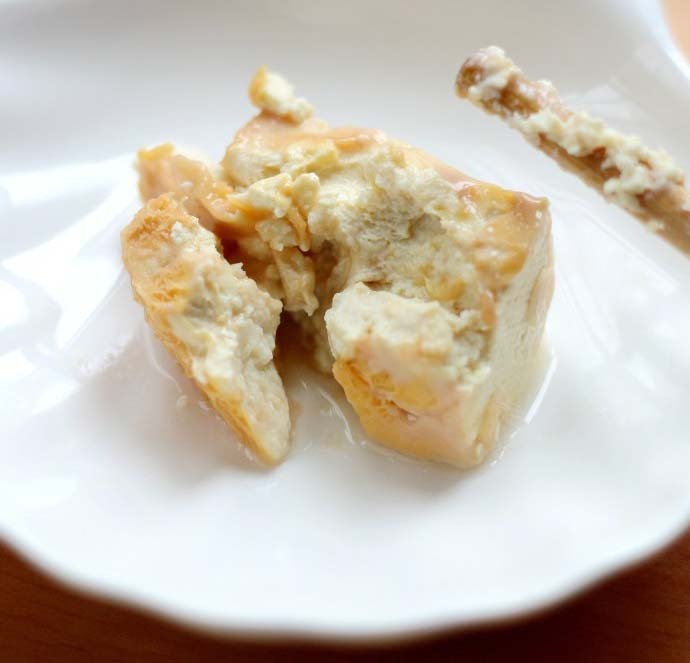 Fermented bean curd is rich in plant proteins. After fermentation, the protein is broken down into various amino acids, which can be directly digested and absorbed. It also produces yeast and other substances, so it can strengthen the spleen and nourish the stomach, increase appetite and help digestion. 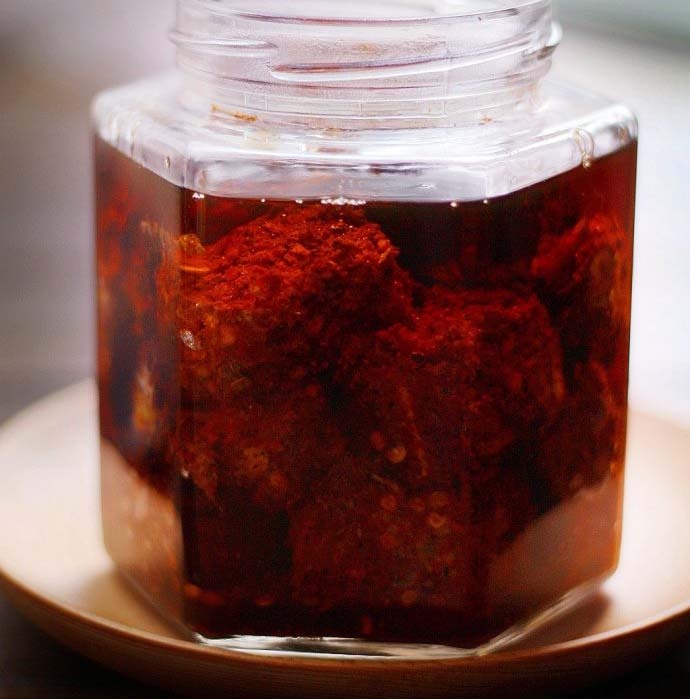 This recipe gives you every detail to succeed, I am sure you can achieve the result if you follow the steps about how to make fermented bean curd. Step 1. Rinse off the tofu. Step 2. 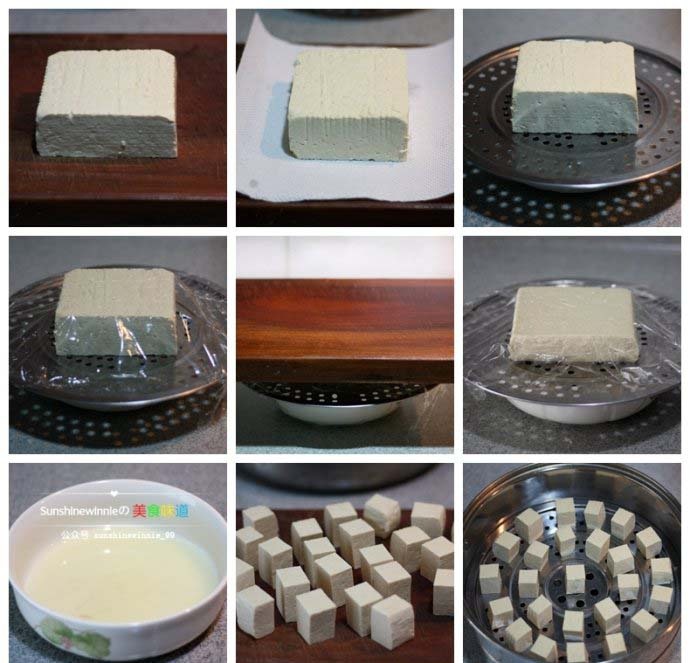 Dry the surface of the tofu with a kitchen towel. Step 3. Place the tofu on a perforated plate on top of a bowl to catch liquids. Step 4. The tofu was covered with a plastic wrap. Step 5. Place a heavy object on top of the tofu. Step 6. Let set overnight. Step 7. You will see that the water is pressed out. Step 8. The pressed tofu dried with a kitchen towel and cut into small pieces (about 2-3 cm each). Step 9. 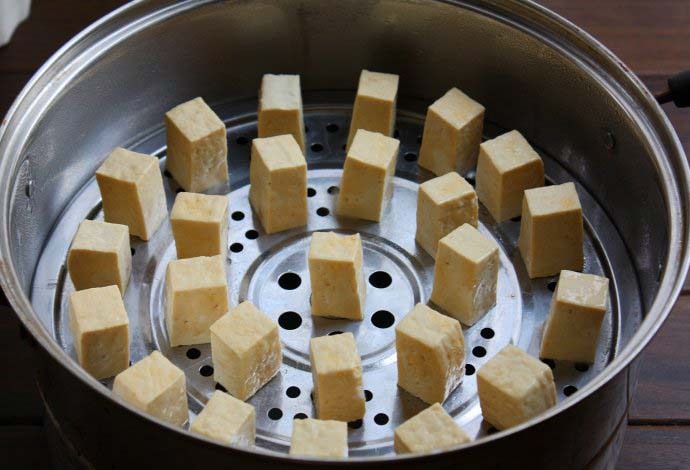 The tofu is evenly spaced, placed in the steamer, covered with a lid, waiting for the tofu fermentation (can be covered in a pot of plastic wrap and then cover the lid). I have made this two different ways: For the first time, I didn’t press the water of the tofu in advance. The tofu was very wet and had almost no molds. 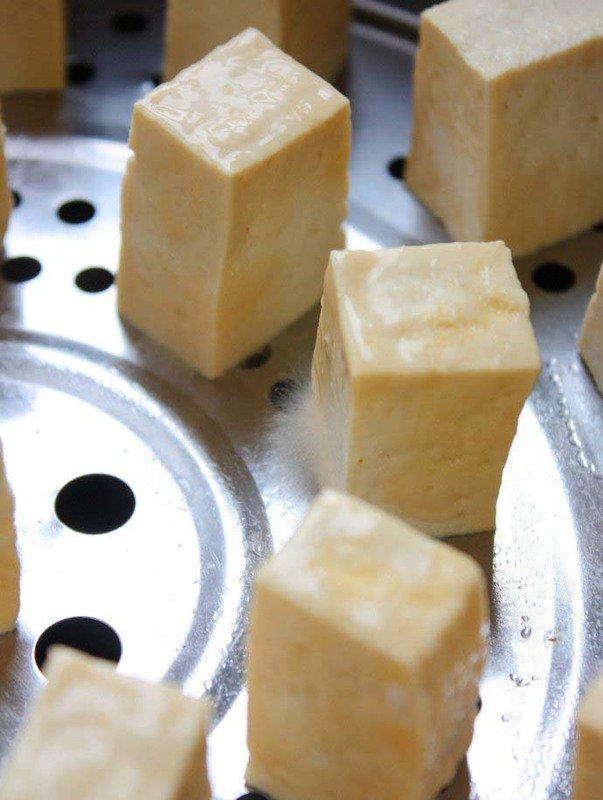 The second tofu was pressed overnight, about 400 grams of tofu turned out about 350 grams, probably because the temperature is relatively high (at room temperature of 21 degrees), the tofu began to turn yellow the next day. It also had the smell (tofu fermentation has a unique smell). 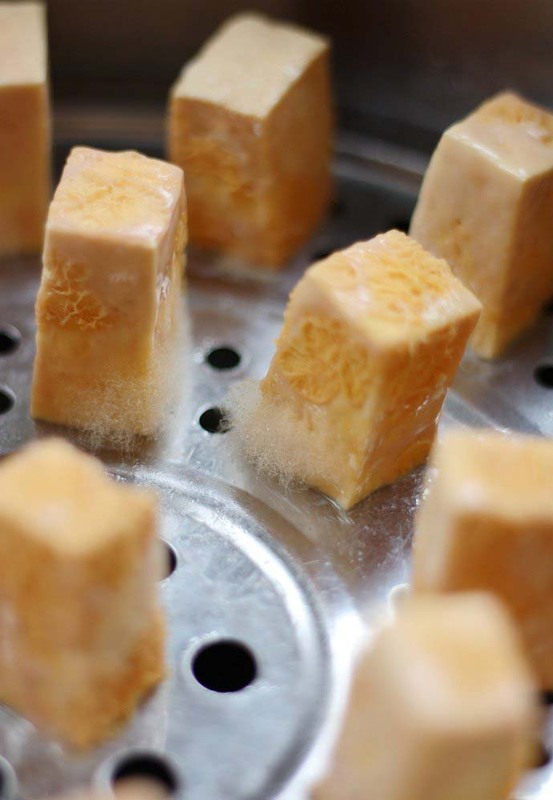 The third day, the tofu colored more, more uniform, and some tofu began to grow a small amount of mold. The picture was taken on the fourth day, and the mold was beginning to grow a bit more. On the fifth day, you can see the fermentation process really beginning to take hold. Poke with a chopstick, the inside is like cheese. If you want to make the tofu softer, you can put it for another day or two. Step 10. Put the seasoning on the plate (the chili powder and Sichuan peppercorn powder in the seasoning can be fried with a small fire, I think this is more fragrant, fried and then used to cool). Step 11. Mix the seasonings together. Step 12. Prepare the white wine. Step 13. Take a piece of tofu and dip into the white wine. Step 14. Roll the tofu in the seasoning. Step 15. Evenly coat in a layer of seasoning. Step 16. Place the coated tofu into a jar that can seal, pour some white wine into the bottle (I probably put about 20 grams), seal and store. Step 17. After one day, pour the sesame oil to completely submerge the tofu, put it in the refrigerator and let set. You can enjoy after a few days, but it is recommended to let set for a bit longer. You can add more sesame oil to keep the tofu submerged, and store for up to a year! 1. It is required to press the tofu overnight. 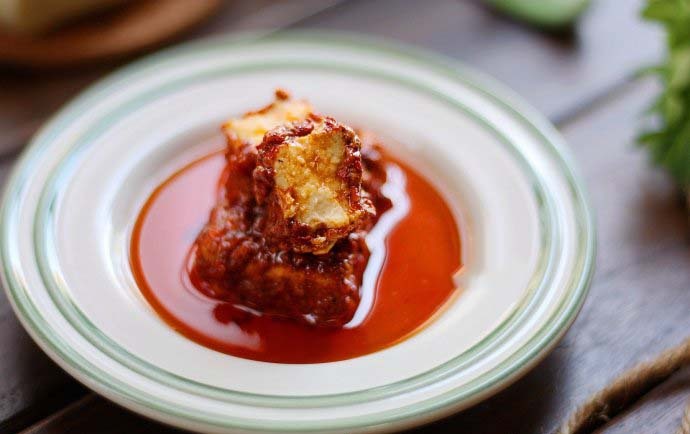 If you do not do this step, the tofu will be too moist and the bacteria will not have the proper environment to ferment the tofu at room temperature (19 degrees). 2. Before actually attempting this recipe, I also searched a lot on the Internet. You can do this recipe safely in the summer time at a room temperature of about 21 degrees. 3. According to your preferences, a variety of ingredients can be increased or decreased. The total amount of ingredients given here is a rough estimate to have enough to cover all of the tofu with some left over. 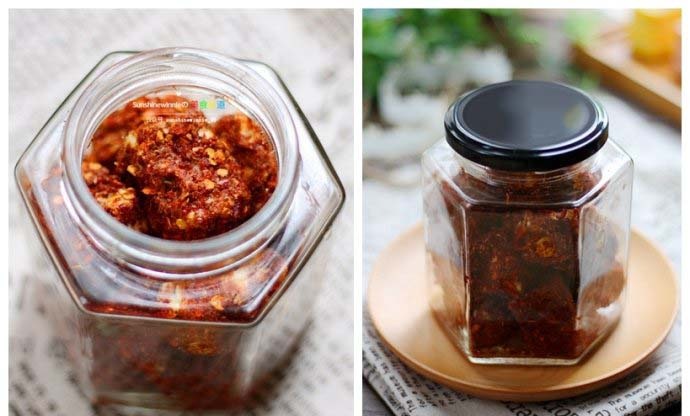 If you have leftover seasoning, you can use for noodles or for BBQ dishes and it will be a delicious addition. 4. When I finally add oil, I use sesame oil. You can also use ordinary rapeseed oil, but I think sesame oil is particularly fragrant, the amount is uncertain, and finally cover the tofu.